This photo and several companion photos arrived by email yesterday. So, it has probably been widely circulated on the Internet and may not be news to you. I am a softie; these kinds of images and stories touch me. When I juxtapose this against an account I just read on Grumpy Old Man today, I shake my head. Don’t worry, it turns out well for the dog, so don’t be hesitant to read it. Very briefly, what happened was that the dog’s family moved and left him (or her) behind. One of the owners would come by every so often and leave it some food, but it was clearly malnourished, wallowing in filth, and starved for attention when it was rescued. That’s the short version; read the whole story here and the follow-up here. How those of us, supposedly made in God’s image, can be less humane, less caring, less nurturing than a mutt is beyond my ken. I know that nature can also be raw of tooth and claw: that has to do with survival and the necessity of filling the belly — kill or die. 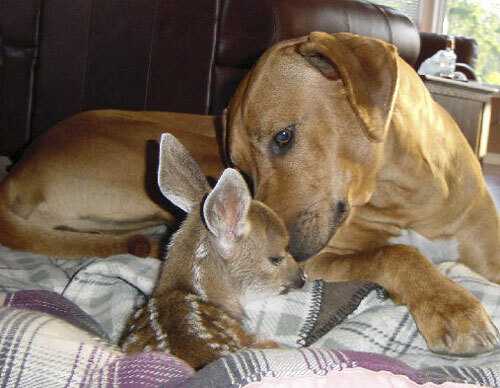 Meanwhile, stories of animal acts of kindness abound. In fact, just as I was writing this, Sue called me in to watch a snippet on TV: about a spaniel who was helping to take care of an abandoned family of baby rabbits. Heart-warming stuff. Barbara Kingsolver opens Small Wonders with an account of young child who wandered away from home in the mountains of Iran. Days later, they found the child in a cave, snuggled up to a mother bear who was sharing its milk with this young, needy, human creature. We don’t know if this is a parable or a true story, but I guess you know what I choose to believe. Here’s how Kingsolver concludes the chapter. Bears and wolves are our fairy-tale arch-enemies, and in these tales we teach our children only, and always, to kill them, rather than to tiptoe past and let them sleep. Maybe that’s why I’m comforted by the image of a small child curled in the embrace of a mother bear. We need new bear and wolf tales for our times, since so many of our old ones seem to be doing us no good. Now we’re finding that it takes our every effort of will and imagination to pull back, to stop in our tracks as hunter and hunted, to halt our habit of killing, before every kind of life we know arrives at the brink of extinction. Some days you have to work hard to save the bear. Some days the bear will save you. My heart grieves (he said ironically) for poor Butterfly who had a bad hair day yesterday. The girl writes a good blog, but I have no follicular sympathy that I can afford to send her way. Yes, her hair has vexed her for most of her life. Yes, it will not usually conform to the current fads. That can be tough on a kid: tough, but hardly traumatizing. Truth of the matter is that she has gorgeous hair: hair that is uniquely hers and also uniquely her — no cheap imitation of somebody else’s fashion statement. Me? I am not having a bad hair day. I’m just having a bad hair life. With a bald father and bald paternal grandfather, I knew from early on that I was in trouble. In my adult years, I was not mollified to be told by the medical poohbahs that baldness in genetically inherited from the mother: not mollified because I was already well on my way to Chrome City. On my way to Chrome City with not one bald person on the matriarchal branch of the tree but with baldness nesting all over the patriarchal branch — if it’s possible for baldness and nests to go together, that is. Baldness inherited from the mother, you say? Balderdash (so to speak), say I. You know, I don’t really mind the baldness too much. I have lots of company, after all. If I had my druthers, of course I’d choose hair, or would have when the choice may have mattered to me. Not sure if I would choose it now though. Truth be told, at the very least, I’m getting used to the guy who I have been beholding in the mirror for more than two decades. At most, maybe I’m even getting attached to him. What tends to irk me though is the back of my head. I actually have some reverse-baldness. I am losing hair from my neck. What I mean is this. If you look at where most guys’ hairlines end, mine is inches higher. Even worse, the hairline is even higher on both sides of centre than in the centre itself. This bothers me more than the usual male pattern baldness — because it’s rarer and odder, I suppose. My dad, bless his shiny dome, had this problem too. His saving grace, however, was that his hair was straight. He could grow it a little longer at the back and, at least partially, cover up that bare patch. However, like Butterfly, I have curly hair: unruly, curly hair. If I try to let it grow back there … well … it becomes rather ridiculous follicular quagmire in short order. I become Pumpkinhead-ish. Back in the hippy days, everybody had long hair, and, being both young and silly, I wanted to fit in. I started to grow my hair. Unfortunately, it would just turn up into the cutest little flip at the back and sides — cute perhaps if I had been born female and was seeking that particular look — but definitely not even remotely hippy-like. Oh, how I tried! I would try to straighten it with hair driers and curling irons; I even went under an old-fashioned hair-drier — with a net on for goodness sakes — once or twice. Gave it up after a burly workman meandered into my boudoir whilst I was sitting under there: yup, my head under a ladies’ salon-style, hair drier with my wife’s hair net on — a pink hairnet if you please! I made a simple decision. Get a haircut and be myself. Much later in life, I made a similar decision to go with the flow by shaving off some silly wisps that lingered on my, otherwise, bald dome. Very recently, I again embraced reality. Since I can’t really hide the neck baldness thing, I have surrendered to reality by shaving my whole head short — of course, I mean hair, not head — that’s just how we say it. We’re rather silly about appearances, aren’t we? We try hard to follow the popular trends and to hide our supposed flaws. But that’s not who we are. We’re not curly people, or bald people, or short people, or tall people. We’re people. We’re human from the inside out, not from the outside in. We need to be like the ducks and the geese. If you haven’t read that blog, click here to unearth another Anvilcloudian treasure trove. I am not a morning person: never was, never will be. Having revealed that, I hasten to add that some mornings are worse than others. There are mornings when I feel pretty good, am relatively alert — for me anyway, if not compared to regular people. Then, there are mornings like this one: mornings where I feel almost as though I am under a weight; mornings when lugging my bod from the chair to the couch seems like a slog. If I can occupy myself at the keyboard for a few hours, I don’t mind feeling like that. I can even accomplish some semi-productive things when I’m in that state: printing another page for the family photo album, for example. Today, however, several yards of mulch were dumped at our gate: too bright and too early. At the very least, I was expecting a phone call telling me that the load would arrive in an hour. “I’ll be okay by then,” I told myself. Not to be: they arrived within minutes of that placating but fleeting thought. So, it was time to slog. Sometimes, you don’t have a choice — ya gotta slog onward — ya gotta keep putting one foot in front of the other … until the job is done. That’s what I did today, wheelbarrow-load after wheelbarrow-load: loading, moving, dumping, spreading. Until all of the mulch, over three cubic yards of it, was resting on its appointed ground. Sue, of the fractured back, poor dear, helped as best she could. She pulled back plants so I could shovel mulch in. Then she would pat the shreds and chips into place. After she could do no more, she prepared lunch and then sat outside with me until the beast was tamed — okay, until the mulch had all been moved. Sue is my partner. Has stayed with me through thick and thin. Stayed with me today, just being there, boosting my spirits when she could do no more. It was enough! She helped to pull me through, just by being there. Yes, it was enough: always has been; always will be. It’s great to have a true-blue, life-partner. Together, we can move mountains. Or at least piles of mulch that seemed to loom higher than Everest on this particular day. Ever since I decided to start blogging, I have spent quite a lot of time looking at other people's efforts. I am having a tough time finding blogs that I want to stick with, but there are some from which I click-off very quickly. If a person can't be bothered to capitalize the letter, "I," this reader will soon be gone. This is a lazy habit in my opinion, most likely born from chatroom reality where time is of the essence. From there, it makes its way into emails. I don't particularly appreciate its appearance in emails either, but I am grudgingly prepared to tolerate it. A blog, however, lives in the public domain. It is a genuine form of publishing, and, the writer should demonstrate respect both for the language and for a potentially diverse audience — some of whom are bound to care about such matters. I have come across some blogs that showed potential — one by a doctor travelling and working abroad — but whenever I discover that an author can't be bothered to follow basic conventions and to capitalize the ninth letter of the alphabet, I soon click away. How hard is it to capitalize one letter after all? Another click-off: if the blog is but three lines long, I conclude that it is nothing but a news-release for close friends who must also have a short attention span. Why wouldn't you just email three lines? If one goes to the trouble of publishing a blog, it would seem reasonable to assume that one would enjoy writing and would have something, however modest, to say. If you're going to go public, you need to demonstrate some pride in your product. What about all those blogs that open with a reference to last night's party, or a hangover, or boyfriend/girlfriend angst? An occasional reference of this sort might be fine, but if it soon becomes apparent that it is the sum and substance of the blog, then off I go. I believe in the value of personal blogs, and I understand that there must be a certain amount of the recounting of days and events. We all do that from time. I do it, and I contend that it is both necessary and okay to do so. But, to hold my interest, a blog must, eventually, contain more. It must contain some thoughts, lessons, applications, or description — something beyond straightforward chronicling. I have stumbled across some fairly popular personal blogs that don't measure up in my opinion. Are they popular simply because the writer has a wide circle of friends? Perhaps these are veteran bloggers whose perspicacity attracted readers in the past, and, having developed a sense of community they now hang on? Do I sound overbearingly elitist? If you've read my stuff, I trust that you realize that nothing could be further from the truth. I'm about as ordinary and unpretentious as one can be. I don't have any great delusions about my own writing prowess either, but at least I make an effort. Perhaps, that’s the key. If you’re going to go live, put just a little effort into it. We were visited by a very impudent squirrel today. The cat made several half-hearted attempts to run him off, but the suirrel's impudence and tenacity were just too much for an old, lame, clawless, fat cat. Confession time: I had a Caesar (as in an alcoholic beverage, and not a Roman emperor) before supper tonight. I never have been one to drink much: partly due to my religious upbringing, partly due to personal taste, and partly due to a certain sense of responsibility. I don’t really have anything against the moderate consumption of alcohol, but it doesn’t particularly draw me. Not on a regular basis anyway. Occasionally, however, I choose to have a beer, a glass of wine, a cooler, or a Caesar. Very occasionally. Along with several bottles of beer, three Caesars have sat in my fridge since Christmas. They exist primarily for company’s sake. Ordinarily, I might have consumed them at a slightly faster rate, but not much in all probability. However, in an effort to make healthier diet choices, I have been even less inclined than usual, if that’s possible, to imbibe alcohol. It’s not just alcohol but my diet, in general. I am eating smaller portions and making better choices. It’s working. Progress is slow, but it’s progress nonetheless. “Everything in moderation,” they say. I am still being very careful, for more inches demand to be shed, but I am trying not to be too regimented. It’s summer in Canada after all. One needs to be out and to enjoy what this short season has to offer: fries at the waterfront; ice cream at the bridge; corn on the cob; and, even an occasional Caesar, or cooler, or … well … whatever. I am not about to throw caution to the wind, but I mean to enjoy myself too, for life is to be lived, not gazed upon ... and it is summer in Canada after all. I wasn’t sure where we were going or how far we’d get when we headed out on our bicycles today. It was 10:30, and, at first, the weather was both a little windy and a little cool. Once we got onto the trail, however, we felt very comfortable. The wind didn’t seem to be much of a factor any more. There is a Tim’s in The Grove, so we stopped for coffee and turkey-bacon-club to go. Sue managed to fit the refreshments into her storage container, and, more importantly, managed not to spill a drop of coffee on our way down to the lakeside where we found a nice lookout complete with benches (photo to right for a view of yours truly enjoying the view of the lake). Time to go home. Well no not yet. We took another detour down to the bridge, rested there for a spell, splurged on an ice cream cone. It was just a single dipper, so we didn’t sin too greatly. Or is a sin a sin? My theology is weak on this point. We finally arrived home, almost five hours after we set out, not really knowing where we were headed. 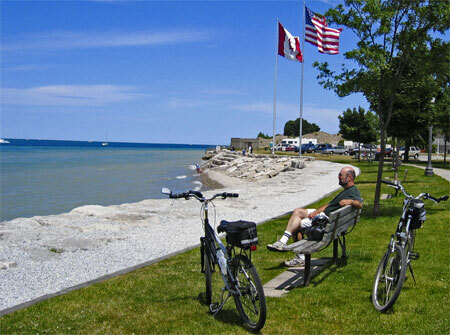 In all, we covered over forty kilometres (twenty-five miles) — not bad for two old fogies who have only had their bikes for a week. We’re pretty impressed and pleased with ourselves anyway. What a great day! We didn’t exactly plan it, and maybe that’s the key. Maybe we tend to over-plan and over-schedule in this era. Perhaps you have to go with the flow every now and then and see where the current will take you. Your journey might be just as delightful as ours was today. Sometimes you feel like writing; sometimes you feel like taking pictures. 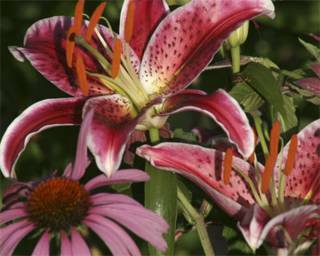 There are so many flowers blooming in the July garden. I wanted to catch this lily (and its neighbours) while it was still in its glory. It's a fresh photo — only about a half-hour old. 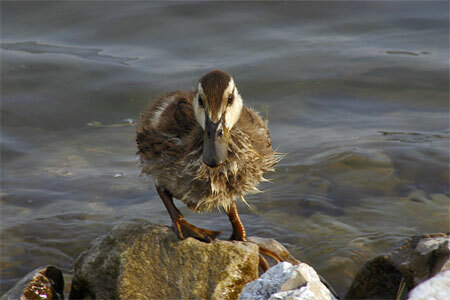 I have to admit to liking this photo of a duckling in need of a good towling-off. The other day, our friends let us try out their “adult cruiser” bicycles. They started biking last year, and frequently spoke of the glories thereof. But we resisted until now, for we two occupants of this household are plagued with bad backs, knees, and whatnots (I throw that in for good measure). Therefore, our reluctance, more mine that Sue’s, was understandable. I had ridden Ally’s bike from time to time in the past few years, and did not find it easy on my back. I hadn’t heard about “adult cruisers” or “comfort bikes” until our friends began preaching of their virtues (the bikes’ virtues not the friends’). And so it was with some scepticism that we borrowed our friends’ bikes the other day, but our scepticism soon gave way to exaltation. The high, curve-around handle bars let us ride in a straight-back position rather that the usual forward hunch. We pedalled down to The Bay and under the bridge for almost two hours. Backs, knees, and whatnots remained comfortable and in good working order. Part-way through, Sue proclaimed that she knew what she was going to do that afternoon. “What’s that?” responded I, thinking to hear that she would be recuperating in bed or soaking sore muscles in a hot tub. But, like me, she was feeling so elated that she had already determined that she would be shopping for a bicycle that afternoon. I was forced to concur, for when mama speaks in that voice, papa listens. Indeed, by mid-afternoon, we had spent the remaining portion of our meagre life-savings (I exaggerate only slightly for the benefit of the narrative) in favour of enjoying the exhilaration of pedal-power. It is now four days later, and we have managed to go riding almost daily for about two hours at a time. That’s pretty darn good for these not-so-fit, somewhat creaky, almost-senior bodies. 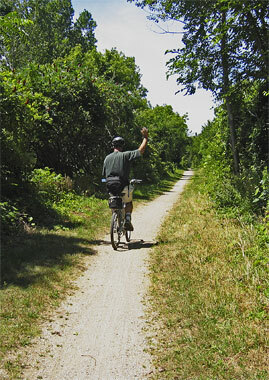 When I’m out there biking, I am also back there somewhere — somewhere in time. It seems as though in some way I have pedalled through a forty-five-year time barrier, as though a backward glance could reveal my boyhood best friend wheeling along behind. I am almost in two worlds at once. The present and past get all crinkled up together somehow. Kind of a neat feeling that. I always liked biking when I was a kid — really, really liked it — but was resigned to those days being long gone. Thankfully, however, that’s one door that I have been able to ride through again. Both Sue and I are having a blast. Isn’t it great when these somewhat serendipitous things happen? If we didn’t have friends who happened to get adult cruisers and who were willing to let us try them out, we wouldn’t have known, wouldn’t have tried. We would have been happy still, for happiness comes from within, but we wouldn’t be experiencing this particular joy. Happiness is wonderful, the state of being that we choose (see Sue’s blog), but special joy often creeps up when we are not expecting it. If happiness is the table from which we dine, perhaps joy is the salt that flavours the food. You can choose to be happy. I have known sick and dying people who have chosen this way of being in the world, and I think I have learned from them. Joy seems to visit sporadically and randomly, but I think that sometimes we can put ourselves in its path. When an option or opportunity presents itself, we can seize the moment, open the door, and walk through. Because nothing is certain in life, I cannot proclaim that joy always awaits us on the other side of the door, but I think it often does. How well I remember my first two hummingbird sightings. I had lived well into my adult years before the serendipity goddess relented long enough to bestow this particular blessing upon me. We had a flowerbed by the gate into the backyard, and as I passed through on this day, my mind on who knows what, I thought I saw an incredibly big bug navigating amongst the flowers. Intrigued, I approached. When it began to fly off, I immediately realized, "No mere bug this." I had glimpsed my first hummer. Several days later, I was lazing quietly on the deck, minding my own business. It was then that the hummer condescended to treat me to a genuine close encounter by visiting the flower baskets which hung but a few feet beyond my grasp. He lingered, fed from the nectar, hovered, and buzzed: in and out, back and forth, up and down. I'm sure that my jaw dropped in amazement as I beheld this tiny but magnificent creation. I felt as though I were in the presence of something ... I don't know ... words fail. Something miraculous? Something divine? To me at least, a marvel. I was deeply moved by this flying miracle. Tears formed, my heart leapt, my spirit gave thanks — emotions whirled and swirled unbidden. As the hummer drank from the flowers, I drank too — deep draughts of nature's finest. I'm sure that the moment must have been brief, that he shortly moved on. But time stopped for me then, and that remarkable twinkling remains forever etched. As I posted yesterday, I have since had glimpses of him or his descendants from afar; and, I have frequently and closely scrutinized his northerly cousins. However, he has never chosen to return to those flower baskets to bestow another blessing on this mere, awkward, lumbering human entity. In an I want it now if not yesterday world, I speak up, here and now, of the merits of delayed gratification. When one has to endure for a comparatively long time before beholding certain wonders of nature, I believe that the wonders become all that more wondrous. I saw neither the sea nor the mountains until I was in my fifth decade. Upon seeing them, however, I was deeply moved, deeply grateful. Just as I had also been touched by the perfect little hummingbird in that perfect little moment. Sunday morning on the back deck. Newspaper and cereal. Flowers and birds. Treated to a brief glimpse of a solitary hummer. I happened to look up at just the right time, just as a hummingbird paid a visit to the Bee Balm and Monkshood — way at the back of the yard; he was not near and hovered only briefly. But, however brief the sighting, I had no trouble appreciating it, even revelling in it. 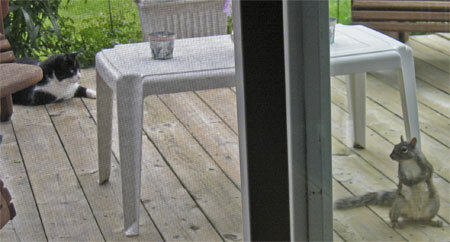 When we're up at the cottage, we can see hummers almost any time of the day, only a few feet away. They visit the feeder that hangs just outside the porch window, the porch where we congregate, particularly in hot weather. These tiny critters are bold, not much intimdated by the proximity of humans. They feed at will, constantly coming and going, whirring and buzzing, hovering and darting. Amazing creations they! How could one not appreciate such visits? Yet, when I'm up there for several weeks and can see hummers almost whenever I choose, I sometimes forget that this is no common sight, have to remind myself of that. I don't have to remind myself to be appreciative when I catch a fleeting and distant glimpse of a hummer from my suburban perch, however. I automatically value it — don't have to think about it. That's part of being human, it seems. When we are surrounded by bounty, we tend not to cherish as we should. We don't mean to be like that, but we tend to need reminding. I am pleased to have been reminded on this fine morning. What a treat! I was thinking this today while I was standing in line at the coffee shop: there are times in life when we change faster than others. Now, as I reflect more, I’m not sure that I was correct. It started when I was, for the thousandth time, contemplating our proposed autumn trip. We went Down East three years ago, enjoyed what we saw, but we know that there’s a lot more to see, and we think that we want to go back. Last time, we mostly camped: looked forward to it, enjoyed it. Today, I found myself standing in the coffee shop, musing that camping didn’t seem all that appealing to me. That seemed to be quite a change in three years and led me to reflect that I might be changing more rapidly at this stage of my life. One can’t deny that there are times in life when we change more rapidly than at others. Young children grow fast. Many teenagers tend to have a growth spurt. I know I did. I ended one school year as a little guy and came back almost full-grown (height-wise at least) the next September. After that, however, we seem to enter a period of stasis. Undeniably, in my mind at least, from our early twenties to around the mid-forties, changes occur gradually, almost imperceptibly. Basically, we’re in our prime. Both mind and body seem to be in reasonable working order. There are changes to be sure: most of us will fill out at least a little, for example. But it seems to be gradual, not sudden. Granted, if you stand an early-twenty-something person beside a mid-forty-something person, you’ll observe a significant difference, but I don’t recall sudden shifts. That’s what I thought, but now I wonder because I recall some definite markers. At forty, or close to it, I bought contact lenses for the first time. I gave up on them quickly because I couldn’t see up close with them very well. I switched back to regular glasses that I could easily raise and lower as required. My next pair of glasses was destined to become my first pair of bifocals. I associate this change with turning forty, and that’s sudden. But would I have noticed it if I hadn’t tried contact lenses just then? Had I already unconsciously been shifting my glasses up and down as needed? I suspect so. I also suspect that many of us peg life-changes to prominent birthdays, that we tend to link turning-forty with anything conspicuous that seems to occur within several years of that milestone. I noted another change at forty. That summer, I took my younger daughter to an amusement park. I discovered that I wasn’t having a really great time. We had taken the kids several times when we were in our thirties, and I enjoyed myself well enough, but, suddenly, I was no longer having the time of my life whirling around in dizzying circles. Was this a sudden change, or had I been enjoying the rides less and less until … until I finally realized that I was no longer having a blast? There I was this morning, well into my fifties, closer to sixty than fifty, standing in the coffee shop, thinking that I have changed faster lately because the idea of camping didn’t fill me with enthusiasm. Four years ago, we travelled Out West (why do we go Out West but Down East?) for a month; we camped and thoroughly enjoyed the experience. Three years ago, we made a similar pilgrimage Down East. Last year, we adventured by Lake of the Woods. This year, however, camping doesn’t particularly appeal to me. That seems like a doggone abrupt change at first blush. But now, I don’t know. If someone were to put the tent up for me and take it down, well by golly, I might still prefer it to an over-priced and over-rated motel room. Or if you could guarantee me good weather, I might yet choose tenting, despite the demands of pitching and breaking camp. On one hand, the fact remains, that not long ago, I was quite willing to camp and decamp with no outside assistance and with no guarantee of propitious weather. On the other hand, it might simply be experience that now cautions me. Had I, in fact, had the same amount of camping experience four years ago as I have now, I might have been just as hesitant. So, you see, I am not altogether certain in my thoughts. I started the blog thinking one thing but have since waffled, and in so doing have had to revise the blog as I went along. And that's wee bit of an inconvenience to say the least! However, the more that I ponder, the more this opinion is emerging: because there is an accumulation of change, there comes a point when we perceive it more. It’s the perception that’s more sudden than the actual change. This is my first attempt to use Blogspot's HELLO system to post a photo. Previously, I have posted photos on my own website and just called them up into my blog. You can insert them into the flow of your comments that way, but I think I could do it using this system too ... with a little patience and practice. In HELLO, I began to type a caption but, mistakenly, hit ENTER to start a new line. I didn't realize that ENTER would actually publish the photo. However, I am able to EDIT the blog in the normal fashion, which is what I am doing now. HELLO just gives me another option. This HELLO system would probably be the best option for most people, and I think that I might use it more and more too. 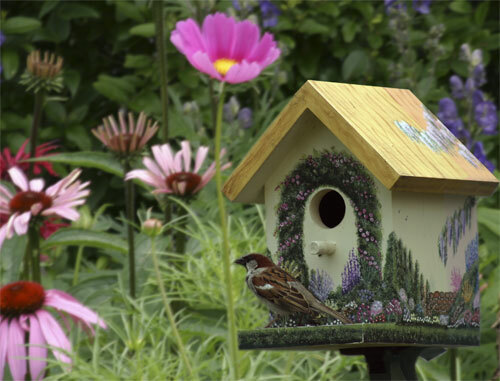 This photo shows the sparrow and birdhouse which were mentioned in my previous blog. I finally got around to taking a photo when we were sitting outside having lunch the other day. However, the birdhouse is not really in the lovely setting that you are seeing; it is actually stationed in front of a rather drab fence where it remains. I only moved it digitally, in this photo, to another part of the yard, and I am much happier with the amended version. It's nice to take photos again, even a few. For the past few weeks, I have been consumed with arranging and printing wedding photos and have been seriously neglecting my camera. While doing the wedding album, I upgraded to the most recent version of Photoshop which involved a bit of a learning curve. In the course of all of this, I also realized that my basic Photoshop skills have been rusting out. So, I bought a new instructional book and have been working through it, reminding myself of various tools and methods and learning some new ones. Learning is such fun — so satisfying. I wish that I had known that all of the way through school. I was a typical under-achiever: too obtuse to know any better. I could have loved school and embraced it rather than disliking it and eschewing it. I can remember a brief interlude when I came to my senses and participated in one particular subject for a while. My marks shot up dramatically: not because I studied harder but simply because I engaged my brain during class and learned naturally, without really trying. What happened what that I was sitting in class one day and was moved to put up my hand to answer a question — uncharacteristic behaviour indeed. Somehow, that activated me and my tiny brain. I soon answered another question, and it got to be a habit — in one class for a certain period of time, that is. I actually had fun being proactive in that class, but I didn't realize it at the time, didn't apply it to any other subjects, and didn't even continue my new behaviour in that or any other subject in subsequent years. What a waste! Although I must take responsibility for my own stupidity, I think my parents were deeply implicated in this unfortunate scenario. I can remember being sent off to school with negative comments ringing in my ears: "Oh, they'll make you tow the line," or "You're in for it now." I really don't recall the exact words any more, but I know that those kinds of comments affected my attitude toward school and learning. They were probably made flippantly in a teasing sort of way, but I think they impacted my approach to school and life for a long period of time. Somehow, I ended up in university where I became a decent student, but I regret not waking up to the joy of proactive learning earlier in my life. It's never too late, but you can't turn back the clock and redeem lost time either. Nature seemed determined to bless me today. It started with breakfast on the deck under bright skies and in moderate temperatures. As pleasant and fine as that was, it turned out to be just the start. After amusing ourselves with our separate but pleasurable pursuits for the morning, we rejoined each other back on the deck for lunch. The neighbourhood birds did everything they could to add to the glory of the day. A pair a beautiful cardinals put in a brief appearance, and then a strikingly brilliant goldfinch perched by a pretty-in-pink Echinacea flower. Sparrows flitted in and out of Sue's two beautifully painted birdhouses. She painted the birdhouses to adorn, not to be functional, but the birds have their own ideas. And when Mrs Sparrow pokes its head out of the portal and peaks about, I consider the adornment complete. After Mrs Sparrow spends a little quality time in the birdhouse, she likes to hop up on the fence and chirp her heart-lifting trills. Perhaps I am deluding myself, but I like to think that she sings for us, that it's her way of thanking us for the little house. After a little more puttering about in the early afternoon, we headed off to Tim's for coffee. You may have to be Canadian to appreciate this, but permit me tell the rest of you that Tim Horton's is a Canadian marvel. No frilly Starbucks for the average Canuck. You can only have one kind of coffee at Tim's, but it's good coffee: the coffee by which Canadians judge all others. Yes, we have our bit of heaven in Canada: plain, simple, and robust — very much like the people of this country. But I digress. 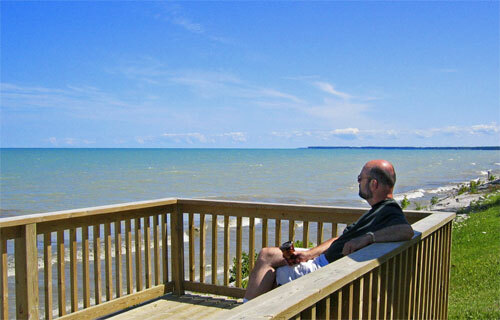 We took our two extra-large-double-creams to The Bay, sat on a bench, sipped the java, and soaked up the view. Water is so uplifting; and, even if the view on the far shore isn't so grand ... well, we can just ignore it and focus on the positive. After sitting and sipping for a while, we strolled along the flat and nicely cobbled bank, frequently stopping to enjoy the ducks and the geese — some in the water and some on shore. The little ones don't have to do anything to be cute; they just are. The adults amused us by sticking their heads in the water and immodestly raising their fannies skyward. Immodest they may be, but they are also very family-oriented, unceasingly vigilant of the little ones: constantly guarding, diligently watching. We saw a solitary, white farmyard duckling swimming nonchalantly amongst the mallards. Was he a stray, or a throwback to a recessive gene in some past crossbreeding hankypanky? I could not tell, but we also saw a goose that was quite obviously a crossbreed: part Canada Goose and part farmyard goose. It had the white fanny of a barnyard goose as well as the larger and orange beak of its barnyard cousins but the distinctive Canada Goose markings on its neck, back, and wings. It's ancestry is unimportant, however, as it acted just like any other Canada Goose and was accepted as an equal by the flock. Indeed, it was either a mother or a father, was partnered with a full-fledged, pure Canada Goose, and was guarding his or her goslings with all due diligence. This moves me: this commitment and dedication to family. Both the odd, white ducking and the mixed-breed goose were totally at home with their friends, families and surroundings. The critters have no mirrors and are not a bit self-conscious. Their families and friends can certainly see them for what they are — different — but they care not a whit. Perhaps they are genuinely blind to the differences, but I prefer to hold that their blindness is willful — a conscious choice. I choose to believe that they say to themselves and to each other: "We're all geese (or ducks) here; that's what matters. That's what." I choose not to belabour the obvious application that we could make for our kind. I prefer just to revel in a day when nature blessed me in so many little ways. There are rich folk in their yachts in The Bay. I hope that they too are occasionally blessed by nature, but I cannot believe that they were any richer than I today. My last blog bemoaned the reality that I haven't read any page-turners lately. I remain unsure whether it is I who has changed or whether I simply haven't chosen the right books lately. However, there are several books that I have enjoyed quite a lot and would like to recommend. One is Eats, Shoots & Leaves by Lynne Truss. Believe it or not, this book that I recommend is about punctuation. It is written in a very interesting and humourous way. In fact, it almost is a page-turner for me — comes fairly close anyway. I think many people would enjoy it, and there is the added benefit that one might learn something about punctuating this wacky language. Try it, you'll probably like it. The second book that I would like to recommend is actually a series about Harmony by Philip Gulley. Gulley is a Quaker pastor who writes folksy anecdotes about a fictional Quaker pastor and his quirky congregation in a Midwestern town called Harmony. It's heart-warming, delightful stuff. My appreciation might be bolstered by the fact that I have a church background and can relate to the zany characters to some degree, but I have the feeling that a whole lot of people would really enjoy these books. If you go to the Amazon link (here and above), you will see his other books listed too. They may all be worthwhile, but I am recommending those with Harmony in the title. I am reading a few chapters of a mystery each night lately: Let Loose the Dogs, written by Maureen Jennings and set in late nineteenth century Toronto. My last book was The Heart is a Lonely Hunter: authored by Carson McCullers and set in the south in the 1930s. I have found neither to be a page-turner and have been content to take in a bite-sized portion most nights at bedtime. Is it the books or I who are at fault — if indeed there is blame to be assigned? Could it be that I have reached another milestone and that I can no longer be captivated by a story, that I am no longer capable of feeling compelled to read on? Is this yet another life-change? It doesn't seem that long ago when a novel could hook my feeble brain and demand to be finished that night. Now, I seem to read because I have enjoyed it in the past or because, on a good night, it helps me to fall asleep more easily afterward. It's fine to read in order to relax at bedtime, but I hate to think that I might never again feel compelled to succumb to the urge to read just one more chapter ... and one more ... until I am done and feel somewhat exhilarated by the experience. I am really hoping that I just haven't found the right book lately, that I haven't really changed that much. Say it ain't so. What could be more banal than this photo of our old air conditioner? Yeah, it is old — over twenty years old. When it was installed, I decided that it was silly to have a rose bush behind it. So, as best I could, working in the narrow confines between the AC unit and the wall, I took my trusty spade and dug, poked, and hacked at the plant. I did my best to get rid of it. Hacked it off well below surface level. Thought I had succeeded in eliminating it. Now, I’m thrilled that I failed. Slowly, steadily, it grew back. Some fifteen years or so later, fifteen years of total neglect, fifteen years of struggling for life between an air conditioner and a wall, it produced a bloom — a single rose. Every year since, it has produced a few beautiful red roses. A few houses up, our neighbours have a full rose bush of exactly the same type. But I am moved by our scrawny little plant with its three or four flowers. I almost get sentimental about it. It does what it can, living in the circumstances in which it does: in a few inches of parched shade between a desiccating AC and a wall. Nature can teach us lessons if we will allow it. There are probably several that this rose bush can teach, but for one, it brings to my mind the adage: “Bloom where you’re planted.” We aren’t all planted in equally fertile ground. Some are not nurtured as much as others. The circumstances that nature and nurture combine to give each person are not equal. 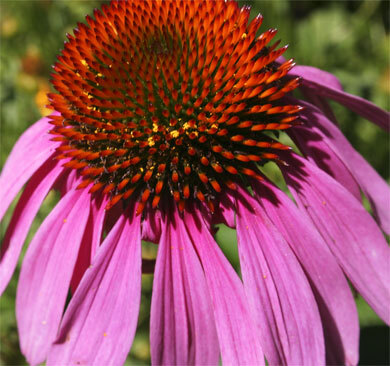 Yet, is it not wondrous when a person manages to produce gorgeous flowers, be they few or many? Is it not even a tiny bit miraculous? You see: there is something about this rose that I appreciate and admire more than it’s more bountiful brothers and sisters. It does what it can, and in doing so, it moves me.